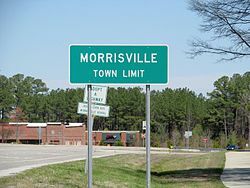 Morrisville is a town located primarily in Wake County, North Carolina (a small portion extends into neighboring Durham County). The population was 18,576 at the 2010 census. The U.S. Census Bureau estimates the town's population to be 21,932 as of July 1, 2013. Morrisville is part of the Research Triangle metropolitan region. The regional name originated after the 1959 creation of the Research Triangle Park, located midway between the cities of Raleigh and Durham. The Research Triangle region encompasses the U.S. Census Bureau's Combined Statistical Area (CSA) of Raleigh-Durham-Cary. The estimated population of the Raleigh-Durham-Cary CSA was 1,565,223 as of July 1, 2006, with the Raleigh-Cary Metropolitan Statistical Area (MSA) portion estimated at 994,551 residents. The headquarters of multinational Lenovo are located in the municipal limits (other headquarters of the company are located in Beijing, China). Morrisville Station: "On April 16, 1865, Union cavalry under the command of General William T. Sherman, captured Raleigh and pursued the retreating Confederate cavalry west along the railroad. Rearguard skirmishes erupted at points along the Hillsborough Road until the combatants reached Morrisville. Using cavalry and artillery, Union forces attacked a Confederate train loaded with supplies and wounded. Before withdrawing, the Confederate cavalry repelled the attack long enough to allow the railcars of wounded to escape while abandoning the supplies. This was the last major cavalry engagement in Sherman's campaign. The next night, a courier from the Confederate commander, General Joseph E. Johnston, rode into the Union camp at Morrisville with a truce proposal. Subsequent negotiations between Johnston and Sherman led to the largest Confederate surrender of the Civil War at the Bennett Farm in Durham on April 26." The history marker notes it was given in memory of Commissioner C.T. Moore. Morrisville was the home of noted artist Mabel Pugh (1891–1986). The Morrisville Christian Church, Williamson Page House, and Pugh House are listed on the National Register of Historic Places. According to the United States Census Bureau, the town has a total area of 8.3 square miles (21.5 km2), of which 8.3 square miles (21.4 km2) is land and 0.04 square miles (0.1 km2), or 0.62%, is water. Morrisville is located in the northeast central region of North Carolina, where the North American Piedmont and Atlantic Coastal Plain regions meet. This area is known as the "Fall Line" because it marks the elevation inland at which waterfalls begin to appear in creeks and rivers. As a result, most of Morrisville features gently rolling hills that slope eastward toward the state's flat coastal plain. Its central Piedmont location situates the county about three hours west of Atlantic Beach, North Carolina, by car and four hours east of the Great Smoky Mountains. The central core of Morrisville is located along the upper portion of Crabtree Creek, which then feeds into Lake Crabtree, located in the southeastern part of the town. Morrisville enjoys a moderate subtropical climate, with moderate temperatures in the spring, fall, and winter. Summers are typically hot with high humidity. Winter highs generally range in the low 50s°F (10 to 13 °C) with lows in the low-to-mid 30s°F (-2 to 2 °C), although an occasional 60 °F (15 °C) or warmer winter day is not uncommon. This is canceled out, however, with several days where highs do not get out of the 30s. There are usually about 1 or 2 substantial snowfalls per winter, occurring mainly in February. Spring and fall days usually reach the low-to-mid 70s°F (low 20s°C), with lows at night in the lower 50s°F (10 to 14 °C). Summer daytime highs often reach the upper 80s to low 90s°F (29 to 35 °C). The rainiest months are July and August. A special census was conducted in 2015, and the total population reported by the U.S. Census Bureau was 23,699. As of the 2010 census, there were 18,576 people, 7,641 households, and 4,752 families residing in the town. The population density was 2,237.7 people per square mile (864.0/km²). There were 8,357 housing units at an average density of 1,006.9 per square mile (390.5/km²). Known as North Carolina's "little India" by locals, Morrisville has become one of the most diverse towns in the state particularly due to the expansion of the technology industry. The racial makeup of the town was 54.0% White, 12.9% African American, 0.4% Native American, 27.2% Asian, 2.0% from some other race, and 3.4% from two or more races. Hispanic or Latino of any race were 5.9% of the population. There were 7,641 households, out of which 37.1% had children under the age of 18 living with them. 50.3% of all households were headed by married couples living together, 8.9% had a female householder with no husband present, and 37.8% were non-families. 30.0% of all households were made up of individuals, and 2.5% had someone living alone who was 65 years of age or older. The average household size was 2.43, and the average family size was 3.11. In the town, the population was spread out with 27.0% under the age of 18, 6.0% from 18 to 24, 44.4% from 25 to 44, 18.4% from 45 to 64, and 4.3% who were 65 years of age or older. The median age was 32.5 years. For every 100 females, there were 96.7 males. For every 100 females age 18 and over, there were 93.2 males. At the 2000 census, the median income for a household in the town was $56,548, and the median income for a family was $64,625. Males had a median income of $46,750 versus $34,528 for females. The per capita income for the town was $32,243. About 3.4% of families and 4.6% of the population were below the poverty line, including 4.1% of those under age 18 and 13.0% of those age 65 or over. Morrisville's location adjacent to the Research Triangle Park, Raleigh-Durham International Airport, and Interstate 40 makes it an attractive location for offices, light industry and hotels. Companies based in Morrisville include Lenovo (U.S.A. headquarters) and Oracle. The Morrisville Chamber of Commerce serves as the economic development arm for the town. The computer technology, clinical trial and telecommunications industries have strong presence in the area. Lenovo is one of the larger employers with 2,215 employees in 2014. Church Street Park - including a cricket pitch and tennis courts. Morrisville operates under the Council-Manager form of government. The citizens elect a Mayor and Town Council as the town's governing body. After each municipal election, the Town Council selects a Mayor Pro Tem. The Town Manager, Martha Paige, is appointed by the Council to serve as the chief operating officer administering all municipal affairs. The current Mayor is TJ Cawley and Mayor Pro Tem is Vicki Scroggins-Johnson. Morrisville Council members include Satish Garimella, Liz Johnson, Steve Rao, Michael Schlink, and Jerry Windle. The North Carolina State Board of Dental Examiners has its headquarters in Morrisville. NC 54 is a major highway that goes through town and provides easy access to Cary, Raleigh, Durham and Chapel Hill. I-40 runs through the eastern part of the town. I-540 / NC 540 serves the Morrisville area and is located to the west of the town. The highway offers access to I-40, North Raleigh, RDU airport and eastern Wake County. NC 147 is located in the northern part of town and provides easy access to Durham. ^ "General Information". Town of Morrisville. Retrieved 2010-06-16. ^ "P.L. 94-171 County Block Map (2010 Census): Wake County, NC (Map Sheet 17)" (PDF). U.S. Census Bureau. Retrieved December 30, 2011. ^ "2010 Census Redistricting Data (Public Law 94-171) Summary File". American FactFinder. United States Census Bureau. Retrieved 11 August 2011. ^ "Annual Estimates of Resident Population Change for Incorporated Places 2010 to 2013". United States Census Bureau. Archived from the original on 2016-01-19. ^ "Annual Estimates of the Population of Metropolitan and Micropolitan Statistical Areas: April 1, 2000 to July 1, 2006 (CBSA-EST2006-01)". 2006 Population Estimates. United States Census Bureau, Population Division. 2007-04-05. Archived from the original (CSV) on 2007-09-14. Retrieved 2007-04-05. ^ Dollar, Ernest. "Morrisville History". Archived from the original on 2008-05-12. Retrieved 2010-06-16. ^ "Morrisville Historical Marker". Retrieved 2011-10-09. ^ Sybil H. Argintar (September 2013). "Pugh House" (pdf). National Register of Historic Places - Nomination and Inventory. North Carolina State Historic Preservation Office. Retrieved 2015-06-01. ^ "National Register of Historic Places Listings". Weekly List of Actions Taken on Properties: 11/05/12 through 11/09/12. National Park Service. 2014-07-03. ^ "National Register of Historic Places Listings". Weekly List of Actions Taken on Properties: 6/16/14 through 6/27/14. National Park Service. 2014-07-03. ^ "Geographic Identifiers: 2010 Demographic Profile Data (G001): Morrisville town, North Carolina". U.S. Census Bureau, American Factfinder. Retrieved December 30, 2011. ^ Kurry, Dawn (Nov 29, 2013). "Triangle's Little India". Triangle Business Journal. Retrieved June 15, 2014. ^ "Morrisville Demographics". Archived from the original on 2013-06-12. ^ a b c "Profile of General Population and Housing Characteristics: 2010 Demographic Profile Data (DP-1): Morrisville town, North Carolina". U.S. Census Bureau, American Factfinder. Retrieved December 30, 2011. ^ "Corporate Information". Midway Airlines. April 18, 2000. Archived from the original on April 18, 2000. Retrieved January 29, 2010. ^ "Major Employers of Morrisville". Choose Morrisville. Retrieved April 13, 2015. ^ Ranii, David (September 30, 2014). "Lenovo's IBM server deal to close this week". The News & Observer. Retrieved April 13, 2015. Lenovo, the world's No. 1 PC maker, is based in China but has a headquarters in Morrisville that employs about 2,200 workers. ^ "Parks and Greenways". Town of Morrisville. Retrieved 2010-06-16. ^ "Morrisville Community Park". Town of Morrisville. Retrieved 2010-06-16. ^ "Shiloh Park / Luthor Green Center". Town of Morrisville. Retrieved 2010-06-16. ^ "Crabtree Creek Nature Park". Town of Morrisville. Retrieved 2010-06-16. ^ "Ruritan Park". Town of Morrisville. Retrieved 2010-06-16. ^ "Indian Creek Greenway and Trailhead". Town of Morrisville. Retrieved 2010-06-16. ^ "Cedar Fork District Park". Town of Morrisville. Retrieved 2010-06-16. ^ Doran, Will (December 29, 2014). "Morrisville gears up for new parks". cary news. Retrieved April 14, 2015. ^ "Youth Basketball". Town of Morrisville. Retrieved 2010-06-16. ^ "Athletics". Town of Morrisville. Retrieved 2010-06-16. ^ "Youth Cricket". Town of Morrisville. Archived from the original on 2011-06-09. Retrieved 2010-06-16. ^ "Town Council". Town of Morrisville. Retrieved 2014-02-22. ^ "Council Members". Town of Morrisville. Retrieved 2014-03-14. ^ "Home." North Carolina State Board of Dental Examiners. Retrieved on May 15, 2013. "507 Airport Boulevard, Suite 105 Morrisville, NC 27560-8200"
Wikimedia Commons has media related to Morrisville, North Carolina.